I love tropical gardens. They are so beautiful and tranquil. I would love to create a backyard tropical garden like the one in this picture. I love this particular garden for a number of reason. First and foremost I think it is very important for a tropical garden to include some sort of water feature, so I really like the fish pond included in this one. I especially love the added feature of the bridge with the pond water flowing underneath it. What an amazing way to add that little bit of detail that will make you feel like you are in some tropical location and not right in your own backyard. The gazebo is another feature that I enjoy. 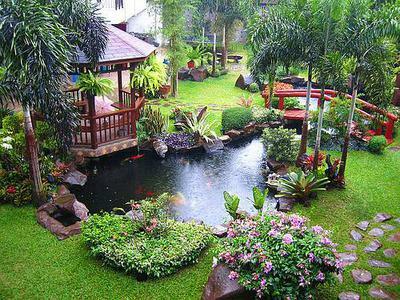 It would be a great place to sit in peace and watch the fish while taking in the beauty of this garden. I like the fact that this garden is lush without being overdone. There is space between the plants which I think gives the eye somewhere to rest, but there are just enough pops of color to keep it interesting. It also makes it seem not quite so overwhelming to care for a garden like this. This is a beautiful tropical garden. Join in and write your own page! It's easy to do. How? Simply click here to return to Tropical Gardens.